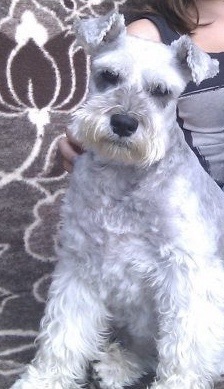 Desperately sad to be asking to rehome our miniature schnauzer Elkie. Unfortunately I am moving abroad to live with my husband after 3 years living apart due to his work being overseas. Our son has now left home to go to University and I can finally join my husband. His work assignments are unpredictable which is why we cannot take Elkie with us. We would consider someone who is prepared to just foster until November 2015 if need be, although if you fall in love with Elkie and vice versa and we see that she is settled, we would absolutely and most definitely allow her to be permanently rehomed. If fostering were an option, we would cover all food and any vet expenses. Heartbroken to have to do this...hope there's someone out there for our bundle of joy. I just wanted to update that we are no longer looking to foster or rehome Elke....as family and friends have come together to help out whilst I go and visit my husband abroad. Just wondered if you have a foster home organised for Elkie. We have 2 male minis ( 7 1/2 & 1 1/5) and would possibly be interested fostering. I know I may be too late, has Elkie been re homed? Have you found a suitable foster home for Elkie. I would be honoured to do it? I was just wondering if you had managed to foster Elkie. I would love to foster her if you haven't. I have met Elke and she is a lovely lap dog with energy...! I need to update that I have decided not to rehome Elke as we realised as a family we would miss her far too much. We really just need Elke to be fostered for a year. I would be grateful to anyone who feels they could foster Elke for periods of upto 10 weeks at a time and then return her to us for two weeks and then do 10 weeks again with two weeks break while she's back with me and could do this up until Oct 2015. I understand this is a very unusual request. Please email me : dianehenderson3@sky.com if you feel you are able to offer Elke a loving home. Hi we have recently lost our much loved miniature schnauzer and would be happy to foster Elkie we live in York and we are groomers so know their grooming requirements. Please let us know. Hi!. Whilst looking at the shnauzer rehoming site we came across Elkie. She looks and sounds delightful and you must be heartbroken to have to part, if only for a relatively short time. We would love to offer her a home! We live on a smallholding on the Lleyn Peninsula and have 10 acres of land for her to exercise, and we have lots of beaches nearby.for lovely walks! We look forward to hearing from you Kind regards, Barbara Stacey. Glasd you have had a good response, please let us know when you rehome Elkie, our readers love to hear -and it will stop peope emailing you in future. Is there an email/telephone contact. So sorry you have to rehome Elkie, it must be heartbreaking. Can you leave an email address in a comment to this post so people can contact you. Good luck in finding her a forever home, she looks and sounds lovely.